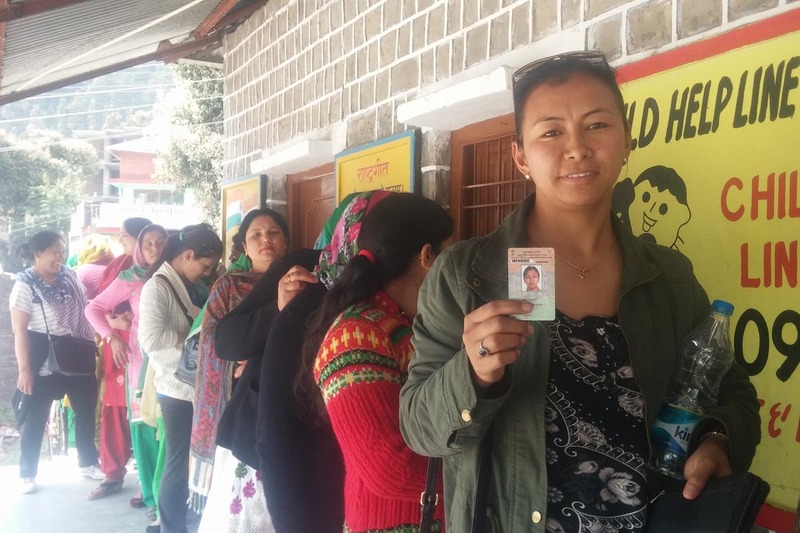 (TibetanReview.net, Mar29’16) – Eligible Tibetans living in the north Indian hill town of Dharamshala have, for the first time, voted in a municipal election which was held on Mar 27. It was not clear how many had voted, although more than a couple of hundred are estimated to have registered as voters. Some Tibetans were reported to have attended election meetings addressed by the state’s former BJP chief minister Prem Kumar Dhumal and one addressed by the state’s Congress government Minister of Housing, Urban Development and Town and Country Planning Mr Sudhir Sharma. The Dharamsala municipal council was upgraded to a municipal Corporation in Sep 2015, becoming only the second after capital Shimla in the state of Himachal Pradesh to be granted this local administrative status. Major political parties such as the Congress and BJP besides others were reported to have put up a total of 113 candidates to fight for the 17 corporation seats. The Tibetan participation in India’s electoral process picked up momentum during the last general election in Apr 2014, when the Election Commission of India issued an order to state electoral officials to register Tibetans born in the country before Jul 1987 and their children as voters. This followed a ruling by the Karnataka High Court in 2013 that Tibetans born in India during that period and their children were citizens under India’s citizenship law and entitled to passports. Before that, the High Court of Delhi had also given a similar ruling in 2010. However, apart from the two petitioners who had gone to court, and were issued their passports, the government of India still requires all Tibetans born in India and their children to register themselves as foreigners. It considers all Tibetans as “refugees” Staying in India temporarily on humanitarian considerations. Only the Dalai Lama, Tibet’s exiled spiritual leader, has been granted political asylum, a fact made clear in India’s Tibetan rehabilitation policy and a related policy document issued in 2014. Earlier, on Jan 10, eligible Tibetans living in the Tashi Jong settlement near Baijnath-Paprola, near Dharamshala, were reported to have been prevented from voting during a municipal-level election. At that time, one Tibetan was cited as saying the local election official had spoken of having been instructed by the Deputy Commissioner (DC) from Dharamshala to block Tibetans from casting their votes.